Watching and attending to a newborn at close range is very important to any parent. On the hand having sleepless nights because a baby is in a crib in another room is unsettling. The bassinet will enable you to have your little one close, at your watch every time. Using your bassinet, you can watch your baby almost all the time. A bassinet is a bed specifically designed for newborns from birth to up to four months old. They play a significant part in your newborn's life. Bassinets offer not only comfort but also entertainment and safety to your little one. Most parents would always wish to buy the best bassinet for their bundles of joy; the only difficulty most parents face is picking a particular bassinet. Sincerely speaking, bassinets are a must have for parents with younger children. They help in building a great child-parent bond. This is because you can attend to your little one from your bed especially when recovering from delivery. BabyBjorn Cradle tops our review because of its sleek and contemporary style. It also has an adaptable and unique design. You will have a first sight love for this bassinet because of the hands-free rocking cradle. The cradle is designed in such a way that it will gently sway without disturbing your little one. The rocking movement will be in sync with your baby’s movement. Your baby will not feel as if it’s a third party disturbance. You can as well induce the rocking by pushing using your hands. This bassinet is not fitted with lighting or electronics; its rocking ability will outweigh the entertainment value these sounds and lighting will have had on your little one. It is stable hence you are guaranteed your newborn will not tip off. - Has transparent mesh walls. - It is water washable. - Free from flame retardants. 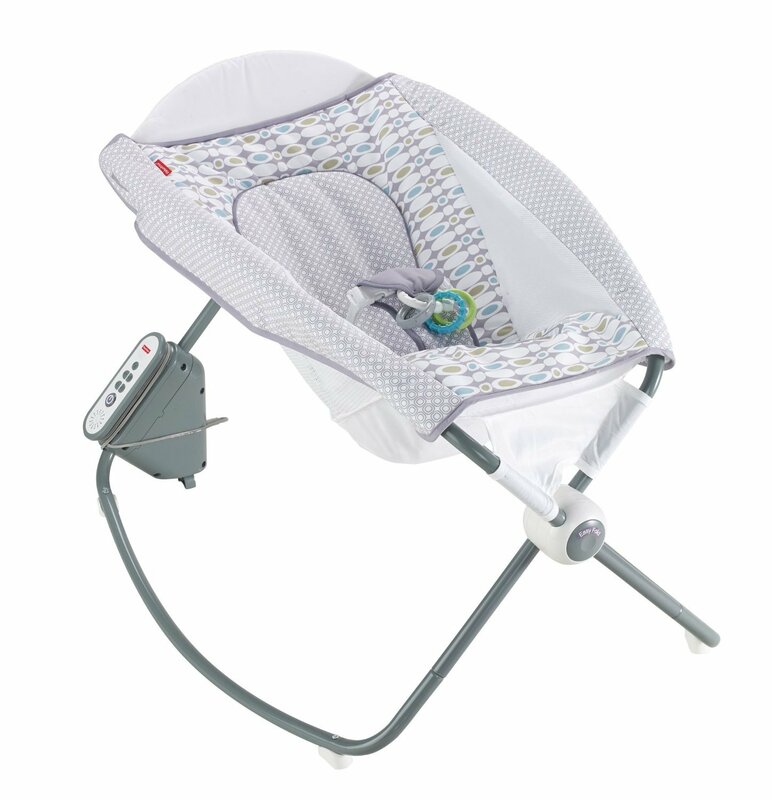 The gentle and soft rocking motion of the cradle soothes your baby. BabyBjorn’s stability will ensure that your little one will sleep safely and comfortably. It is light hence can be moved from room to room. The meshed sides provide good ventilation for your little one. It is also breathable in case your little one’s face comes in contact with it. It is washable hence can be easily cleaned and dried. It has a waterproof mattress that will be easy to clean by wiping. The meshed-sides can be unzipped and washed on a gentle cycle. This bassinet is designed for newborns to up to six months old. 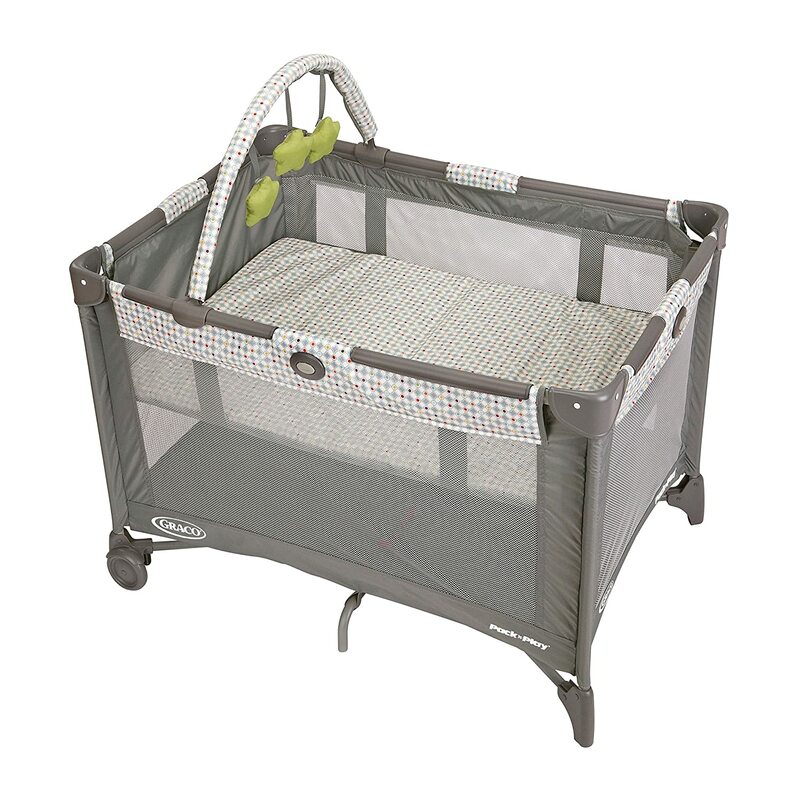 Graco Pack N play Playard Bassinet is designed to keep your newborn comfortable and relaxed. It is suitable for home or away use. It is fitted with a removable, cozy and comfy bassinet that will always keep your little one restful. It comes with a play yard that is full of toys that will entertain your newborn. In addition, your little one will love the visual stimulation in the bassinet. It is suitable for little ones who are less than 15 pounds and unable to push up hands and knees. - It has a toy bar full of soft toys. - It has a carrying bag that will be suitable for no-fuss travels and storage. - It has a long lasting frame. - It has automatic folding feet and wheels giving room for a compact fold. - It has a playpen changing station which provides a great experience with many possibilities. - Has airy and meshed sides. It is lightweight hence can be carried anywhere. The Graco folding signature makes it easy to pack during road trips, vocational travels or even during picnics. The frames that house the convenient and removable bassinet are durable which gives Graco Pack N Play Playard Bassinet, an upper hand. It is water washable with a waterproof covering that will be easy to clean by wiping. It is a pack and a go kind of a bassinet. The toy bar can easily be dismantled and packed without any hassle. It does not support the rocking movement. Arms reach Co-sleeper is another suitable bassinet for co-sleeping with your little one. It is designed in such a way that you can use it next to your bed. Its 11’’ high side rails can be extended to raise the bassinet mattress to a closer height to your bed mattress. This will help you attend to your newborn while comfortably sleeping in your bed. Arms Reach Co-sleeper is the perfect bassinet that will increase the bonding between you and your newborn. This bassinet also comes with a big storage basket underneath it that will allow you store baby’s accessories. - It has a huge convenient large storage underneath it. - It has adjustable rails. - It is light weight hence can be moved from room to room. - It also comes with side pockets which are also good for storage. It has meshed sides perfect for ventilation and safety. The huge basket underneath it can be used for storing toys, diapers, wipers and changing clothing. 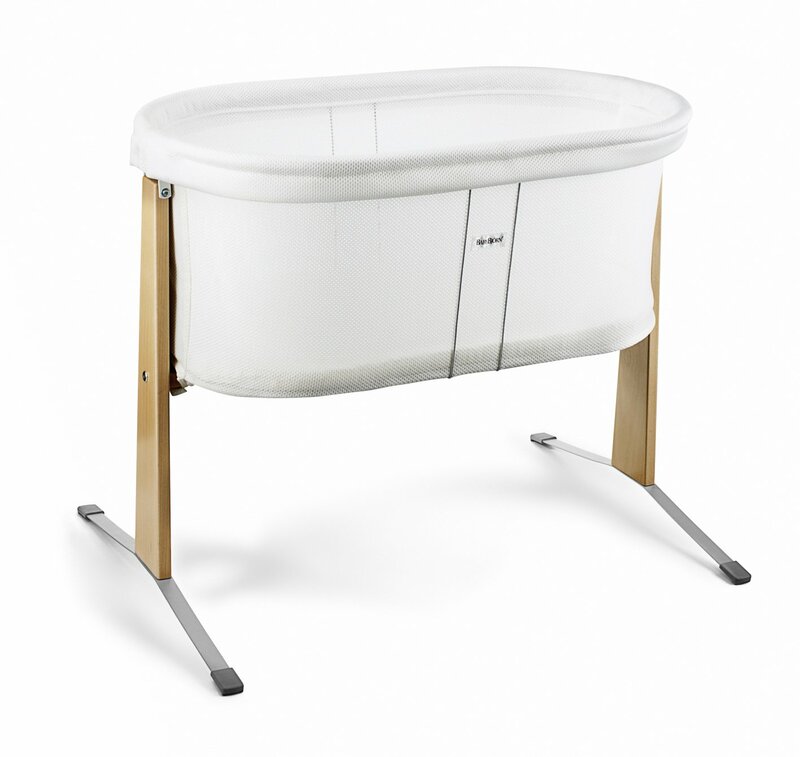 The bassinet mattress is water proof hence you can easily wipe it clean and it also makes this bassinet water washable. Arms reach co-sleeper comes with side pockets which are great for storing accessories like diapers and pacifiers. 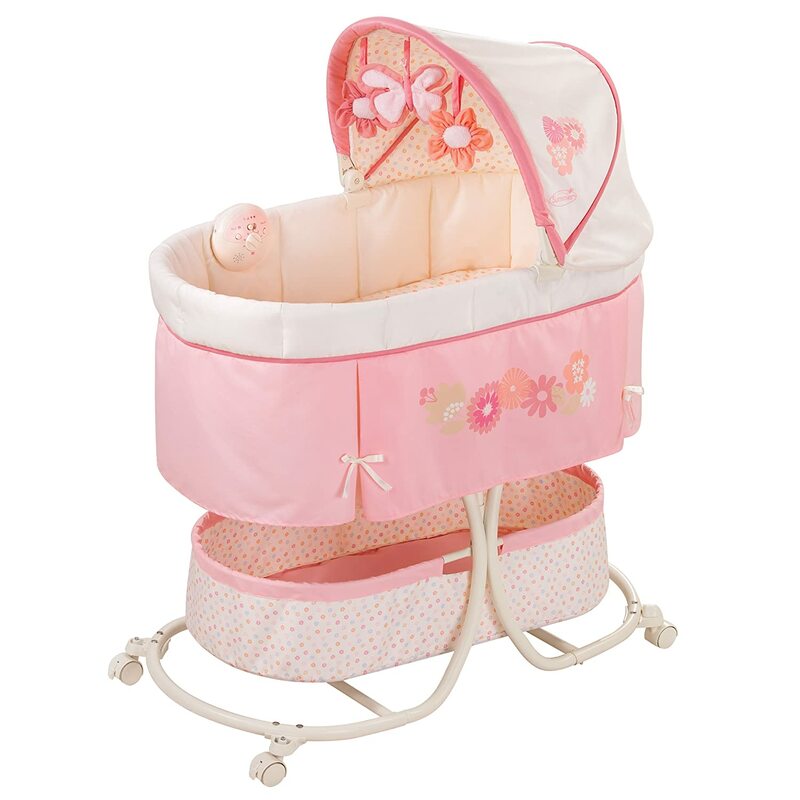 This is a bassinet that will entertain your little one in several ways. It comes with entertaining musical sounds which include two nature sounds and music that will lull your little one to sleep. Beneath it is a huge basket that will be suitable for storing baby accessories. The bassinet is also decorated to give your baby a scenic view and bring that childhood feeling home. The canopy on top of the bassinet also completes the beauty of this bassinet. 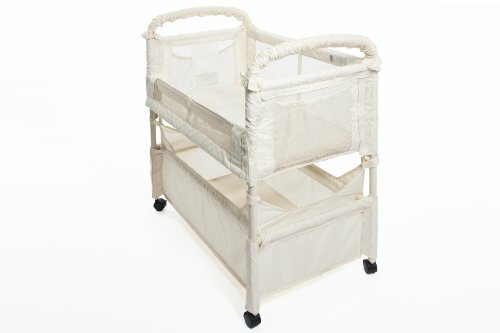 What’s more, this bassinet has a collapsible canopy that will make it easy for you to make your baby comfortable in it. - It has a collapsible canopy. - It has transparent meshed-side walls. - It is fitted with smooth melodies. - It has a modernized design with wheels. - It has a fancy stitched bassinet. The collapsible canopy will prevent light from disturbing your little one during nap time. It is also embroidery hence water washable. The mattress cover is a fitted sheet that is water washable. This bassinet comes with soothing melodies from 1 womb sound, two nature sounds and soothing vibration that will keep your baby entertained. It has a huge basket beneath it that will help you store baby essentials. The modern design has mounted wheels that will enable you to move the bassinet from room to room or even when outdoors. Its beauty makes it suitable for little ones. 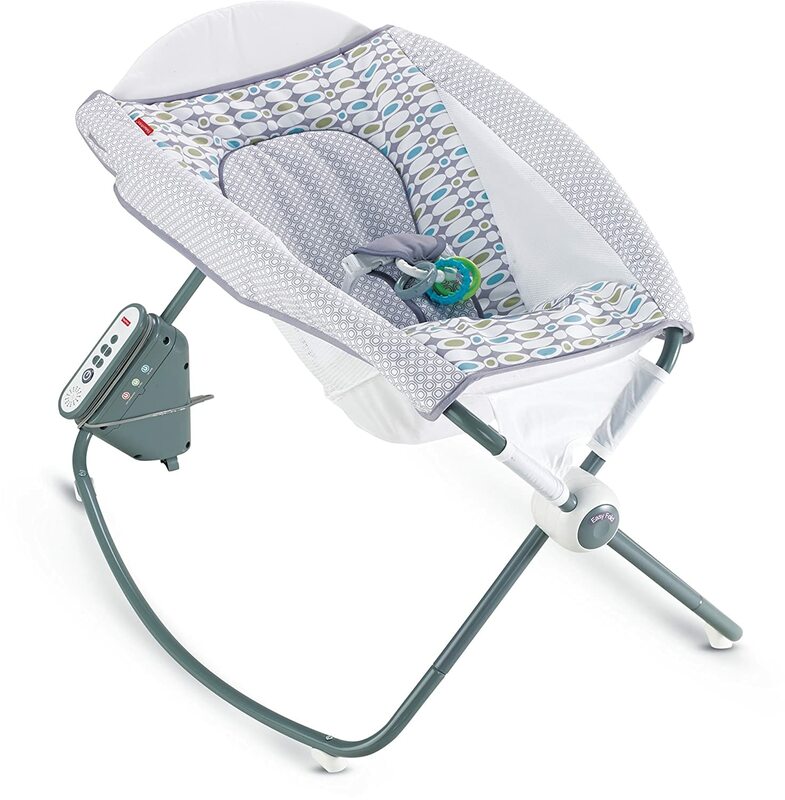 Fisher-Price Rock ‘n play will be a perfect helper in terms of calming your child. Its rocking feature is just but excellent. The rocking is driven by a motor inside the bassinet. It is also inclined to help your baby with digestion which is a superb motherly feature. Its elegantly designed stand will make the bassinet tower low beside your bed. This will help in providing you with a good view of your baby from your bed. It is also great for naptime, playtime, and daytime as it lulls your little one with amazing melodies and a linkable clacker toy. The extra deep seat makes this bassinet the perfect one for your little one. - Has a button powered rocking motion. - It has sound melodies which comprise of three sound effects and twelve songs. - It is compact and can be folded. - Has an AC plug for charging the operational battery. - It has machine washable pad. It is absolutely amazing for bed time, playtime and naptime. The hands-free rocking movement will lull your little one all night long. It can be folded, and it is portable, hence can be carried and packed during grandma visitation or family vacations. The machine washable pad makes it easy to clean. The deep inside baby seat makes it comfy and cozy for the little one. It also makes your little want to sit on it all day long. The 12 song melodies and 5 sound effects will always keep your baby entertained and busy while you attend to other chores. The plug for ac battery may limit the position for use or location you would wish your little one to sleep from. A bassinet is a great companion for any mom with a newborn. Having a satisfactory bassinet will ease your experience. A perfect bassinet should be safe, entertaining and help you in some way nurse your little one. After reading this comprehensive review article, we are confident that it will be very easy for you to make an informed decision when buying the best bassinet for your baby. While all these bassinets are worth giving a try, we would highly recommend the BabyBjorn Cradle. This bassinet will give you a whole new level of experience with your newborn that has just arrived. It is light weight and with rocking movements that will calm and soothe your little one. Let your bundle of joy sleep like a King, whenever you’ll be thinking of buying a bassinet then consider any of the bassinets reviewed here. ● They are completely portable. Bassinets are lightweight, compact and easy to handle. Therefore your little one will have a superb nap while you are away from home or even when traveling. ● Late-night nursing is made easy. With a bassinet in your home late night changing diapers, feeding or medications become easy. ● Bassinet gives you a sense of bliss. Nothing can be compared to the feeling that comes when you see your little one is safe and sleeping well. A bassinet will give you peace of mind. ● The bassinet is a suitable companion for a mom recovering from delivery or having limited movement. Bassinets vary in weight and size depending on their uses. Bassinets that are used around the house or outside the house are light and compact. Those that are used as little ones’ cribs are normally small sized and a little bit heavier. You should, therefore, chose your little one’s bassinet basing on these two factors. A good bassinet should have cobwebbed sides to reduce the risk of suffocation when your little one’s face comes in contact with its wall. While buying your little one a bassinet, look out for the safety seals. The bassinet should be safety certified by the ASTM and sealed by JPMA. The presence of these safety seals, however, does not guarantee safety. It is your duty to confirm if the bassinet is safe for your little one. A good bassinet, should not only act as your little one’s crib but also as a closet. It should have a storage unit for putting your little one’s diapers, clothes, wipes and toys. A good bassinet should ensure that your baby’s experience is not only about sleep but also a playful moment. A bassinet with in build toys will render your child’s wake time busy and happy while you attend to other chores. An excellent bassinet should be able to move gently forth and back while your little one is on it. This will seduce your baby into sleep. Colorful lighting and baby music are a good source of entertainment for your little one. They will serve as a distraction while you are busy in the house. It is important however to note that they might be disturbing, and hence you should not over expose your baby to them as they may prevent sleep. A canopy in your baby’s bassinet will ensure that your baby will not be disturbed by your bed room lights when you are reading or doing any late night chore. Hanging Chords may lead to strangulation; you should, therefore, double check your little one’s bassinet for the presence of loose cords from toys or curtains before placing your baby in it. Back sleeping for your little one will ease breathing and reduce risks of suffocation which might occur while sleeping on the tummy. If you are fond of moving your baby’s bassinet a lot during the day, you should always double check on the wheel locking mechanism. This is to prevent it from moving by itself or rolling over even when it is not pushed. Bassinets are usually designed for only one baby, having two or more babies on it will be a huge safety risk. Adding a mattress or padding on top of the mattress that comes with the bassinet will interfere with ventilations. Using inappropriate baby sheets may lead to a suffocation hazard. Without much hubbub, here are our reviews for the top five best bassinets of 2018. Please contact us in the comments section below with any issue you’d like us to address. Please share this article with your friends as well.